Updates download and installation as well as iOS restore is often carried out through iTunes. It is a dedicated media library or mobile device management application created by Apple for iDevice users for various purposes such as playing, downloading, and organizing digital multimedia downloads such as music and videos available on the iTunes Store. In order to use iTunes, you will need a personal computer that runs on either MacOS or Windows operating system. Given its complex functions, iTunes is deemed among the robust tools specifically designed for Apple device users. But just like any other software, iTunes also has its own share of flaws as manifested by various error codes that prompt users whenever things go wrong. Each of these error codes is accompanied with pertinent messages, prompting users on what went wrong and what to do so as to rectify the glitch. Usually these errors are temporary and occur randomly on various software apps in mobile devices. Apple’s media library, iTunes is among the applications that can bump into these errors at certain times. Among the common errors encountered by iDevice users when using iTunes to install updates or restore iOS would include the iTunes error 1671. What does iTunes 1671 means, how it affects the iPhone functions, and what would be the applicable solutions or workarounds to deal with this error on the iPhone 7 Plus? These are the questions that will be tackled in this post. Read on to learn more. What is iTunes error 1671 and how does it affect your iPhone 7 Plus? 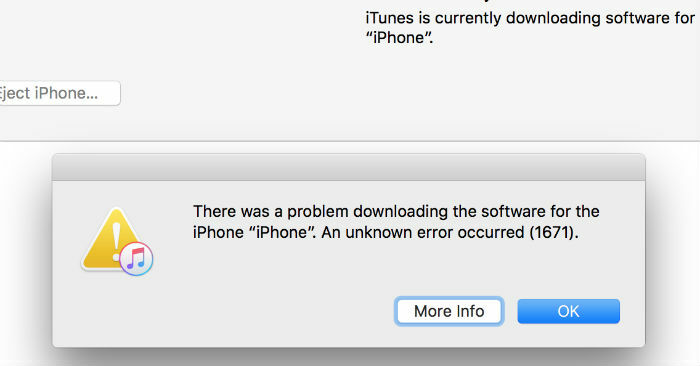 As explicated on Apple’s official support page, iTunes error 1671 typically prompts to let users know that iTunes is still downloading necessary software. Thus if you are prompted with this error code, all you have to do is wait until the recent download is finished and try using iTunes again at a later time. However, there are some cases that the error 1671 is triggered by other factors. As a result, you get stuck and neither could continue or finish updating or restoring your iPhone iOS on iTunes. Among other factors that trigger the same iTunes error to show up would include an outdated operating system of the computer you are using, outdated version of iTunes, security software (antivirus), computer bugs or viruses. Connecting multiple USB controllers to the computer simultaneously can also prompt you with the same error code while using iTunes for iOS update or restore. The same thing can happen when using a faulty or slow USB hub to connect your iPhone or other iDevices to the computer. How to fix iTunes error 1671 on your iPhone 7 Plus? Given the possible causes, you now have some clues on what to work on and where to start when troubleshooting error 1671 on iTunes. These methods however are only deemed generic solutions, which means that they don’t guarantee a definite fix. But then again, any of these methods can still be helpful so you may as well consider giving it a try beforehand. Step 1. Check and ensure that your computer’s operating system is updated. The computer’s operating system version matters when it comes to iTunes compatibility and vice versa. Just like other software or computer applications, iTunes also have its minimum system requirements to be met including the OS version of the computer for it to run on. Step 2. Make sure you are using the latest version of iTunes on your computer. The iTunes version also matters when it comes to an app’s efficiency and compatibility. Given that your iPhone 7 Plus is running on the latest iOS version, most likely it also requires iTunes or any other apps to be on their later or latest versions for them to work without any flaws. If necessary, download and install the latest version of iTunes for your Windows or Mac computer. Doing so will rule out the possibility of the error being triggered by software incompatibilities. Step 3. Temporarily disable security software on your computer. There are some instances when iTunes won’t function as intended due to a security software like antivirus or firewall installed and activated on the computer. Security tools are designed to prevent any form of threats to the computer system. When you connect your iPhone to the computer, any security software installed on the latter device will consider the iPhone among other external devices that may contain some threats. And to prevent such threat to completely penetrate and affect the computer’s system functions, security software will take necessary actions like denying your iPhone from having full access to iTunes. Depending on how a security software is configured, your iPhone may be granted with limited access or no access to iTunes at all. Another important thing you need to consider when it comes to a security software on the computer is to ensure that it is updated. Step 4. Use only high-speed USB cable/port. USB cable and USB port also plays an significant role when it comes to using iTunes to update or restore your iPhone 7 Plus operating system. Using a slow USB port or faulty cable can result to a corresponding error when using iTunes to manage your iOS device. Errors that are associated with this factor are already deemed hardware issues that can likely be rectified by using alternative cable or functional ports on both devices. After completing all the prerequisites and the iTunes error 1671 persists, here are a few recommended workarounds you can try on. Highlighted below are generic solutions used by other iPhone users who have dealt with the same error when attempting to update or restore their iPhone with iTunes. Feel free to try any of these methods, whichever you think is best applicable to your situation. First solution: Reboot your computer and your iPhone 7 Plus. Shutdown the computer, usual way. Wait for at least 30 seconds then power it back on. Reboot your iPhone 7 Plus by pressing and the Sleep/Wake button and then slide to power off. After a few seconds, press the Sleep/Wake button again until the Apple logo appears. Wait for the iPhone to reboot completely. Connect your iPhone to the computer using a high-speed USB cable the open iTunes on the computer. Wait for iTunes to recognize your iPhone 7 Plus and then proceed with iOS update or restore. Second Solution: Disable antivirus or firewall on your computer (if applicable). If you have installed any security software like antivirus or firewall on your computer, try to disable it temporarily and then see what happens. Alternatively, you may opt to configure the antivirus or firewall installed to allow iTunes updates and restore processes. Doing so will rule out the possibility that the error is triggered by a security software denying your iPhone 7 Plus from getting full access to the computer system, iTunes, or Apple server. You can re-enable the software after you have successfully restored or update your iPhone through iTunes. Third Solution: Try to move the hosts file on the computer to another location. Other iPhone users who have dealt with iTunes error 1671 when attempting to restore or update their iPhone were able to get rid of the error by moving the hosts file. It’s a system file that maps hostnames to IP addresses and lets you define which domain names or websites are linked to which IP addresses. Its main function is to assist addressing nodes in a computer network, block or redirect websites, and more. And for some reasons, moving the computer’s hosts file bars the error 1671 from showing up when doing iOS upgrade or restore on iTunes. Locate the hosts file on your computer. If you are using a Windows computer, the hosts file is usually located in this directory: C://Windows->System32->drivers->etc. Find the file named hosts then drag it to your desktop. Open iTunes again and retry to restore your iPhone. When the restore successfully completes, move the hosts file back to its original folder or directory. While there is no definite explanation as to why and how this file works with iTunes, a number of iPhone users have found the remedy and fixed this error by carrying out this workaround. Fourth Solution: Put your iPhone in recovery mode. Open iTunes on the computer. Make sure you are using the latest version of iTunes. Force your iPhone to restart. To do so, press and hold the Sleep/Wake and Volume Down buttons simultaneously. Do not release the buttons when the Apple logo appears. Wait for the Recovery Mode screen to appear. When you see the recovery mode screen, release both buttons. If prompted with the option to Restore or Update, select Update if you want to install the latest version of iOS or Restore to restore from a previous iOS backup. When you select Update, iTunes will attempt to reinstall iOS without erasing your data. Just wait while iTunes downloads the entire software for your iPhone. If the download takes more than 15 minutes and your iPhone exits recovery mode, just wait until the download is complete then start all over. After the update or restore completes, you may then proceed to iPhone setup. If none of these recommended solutions is able to fix the problem on your end and that you’re still prompted with iTunes error 1671 when trying to update or restore your iPhone 7 Plus, then at this point you should consider escalating the problem. Contact Apple Support or your carrier to let them know of the ongoing issue so as to ask other options and recommendations. Meanwhile, if you suspect that the problem is associated with a faulty hardware, you can take your iPhone 7 Plus to an authorized service center instead and have it diagnosed further by an authorized technician. Do the same if you’re prompted with the same error and you cannot go for a recovery mode restore due to some damaged keys on the iPhone.